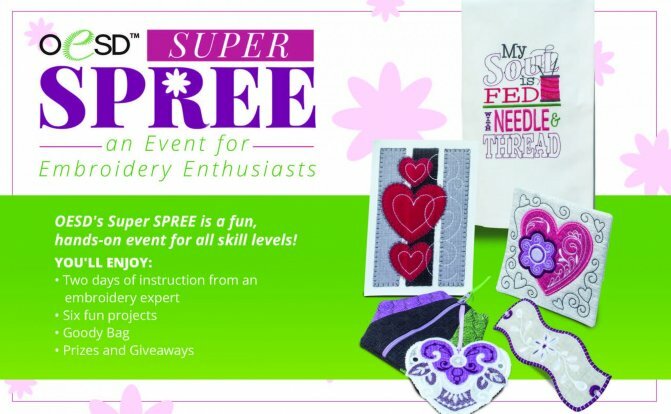 Stitcher's Quest will host this two-day SPREE event at Holiday Inn Resort on Okaloosa Island, Fort Walton Beach. Each attendee will receive a kit with supplies and design files for six projects. 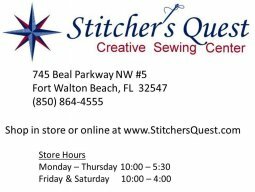 Stitcher's Quest will provide the BERNINA machines to for use at the event and attendees will take turns completing projects. Registration includes lunch both days, and a goody bag valued at $200. Attendees will gain experience and advanced knowledge fo embroidery methods and the designs available from OESD. The design files included with the event can be used on any current domestic embroidery machine. There will be something for everyone at this event - novice to experienced. If you are considering a new sewing machine with embroidery capability, this is a don't-miss opportunity for event pricing. The EVENT SPECIALS will be AWESOME! Advance registration is REQUIRED and space is LIMITED. Registration closes January 25th. SPREE Registration does not require or include hotel reservations, but we do have special rates arranged at the Holiday Inn Resort for those who would like to stay. The group block closes on January 15. Hotel reservations can be made at this link: OESD Super SPREE Lodging or call the Holiday Inn Resort at 850.301.9000 and ask for OESD Super SPREE group block to receive the group discount. Click here to visit our calendar or on the photos to register for classes online. This is the year to get those quilt tops out of the closet! This class will certify you to operate the Q24 longarm for in-store rental! We will cover the basics on how to operate the machine for free-motion, ruler-work, and pantograph. You will learn how to properly maintain the machine, thread the machine and wind bobbin. All materials will be provided. This certification class will allow you to rent time on our Q24 for free-motion quilting, which includes pantograph tracing and ruler-work. Q-Matic Certification is a second class - this is the prerequisite for Q-Matic Certification. This class is required prior to scheduling rental time on the Q24 that includes use of the Q-Matic system. Customize your quilt with beautiful quilting that highlights your embroidery, or stitch perfect pantos with the use of the edge-to-edge quilting designs. This approximately 3-hour course will allow you to use the Q-Matic system. 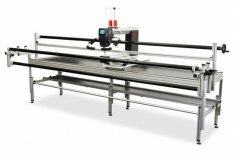 Longarm Certification is a prerequisite of this class. Dive into BERNINA Embroidery Software 8 DesignerPlus! These ten lessons will continue to explore the features of Software 8. You will appreciate why software is the perfect companion to your embroidery machine. Class 1 - Cuts Like a Knife - Learn the ins and outs of the knife tool, including the changes that have occurred with Version 8.2. The lesson will include how to create split applique designs. Class 2 - Cut it Out! - With Software 8, new uses for the CutWork Tool were added to the features of the software. Learn how to create cutwork applique for use with the CutWork Tool or for your cutting machine. Class 3 - No Holes Barred - Software 8 has five different types of embroidered holes that can be created. Learn how to create embroidered cutwork using the new features of Software 8 and learn the diffeence between the 5 types. Class 5 - Picture This - Explore Corel PHOTO-PAINT and learn how this program can be used in conjunction with Software 8 to create one-of-a-kind projects using your photographs. Let April guide you through the secrets of a beautiful hot pad design. 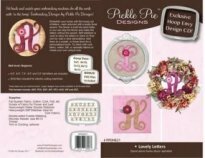 Join us in stitching these elegant monograms from Pickle Pie. They are beautiful for wall decor or for personalizing of a unique gift. Thursday, January 25 - All Day - and it's FREE! Open sewing day in our classroom. Bring your machine, project, and supplies and sit with friends for a day of sewing. Please register as seating is limited.